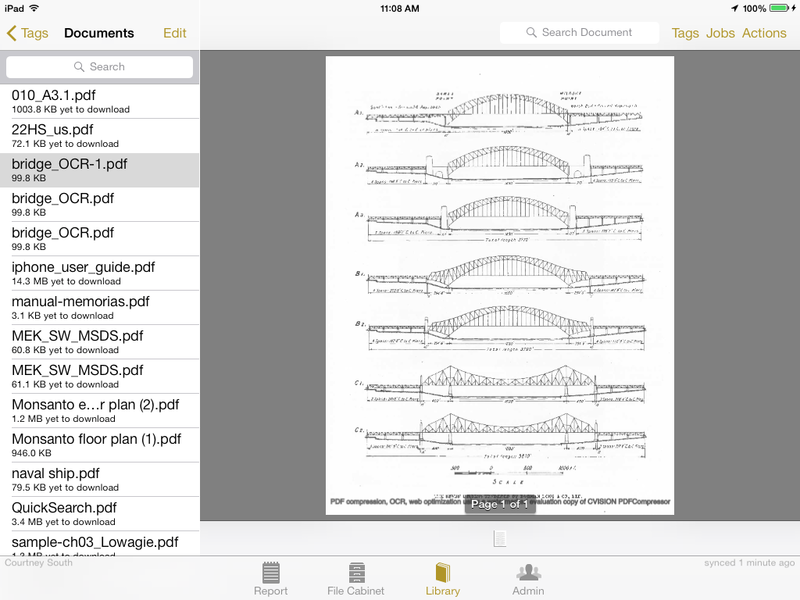 The Document Library brings an array of new functionality to the job-site. From managing employee access to job-specific documents to keeping everyone as up-to-date on a project as you are, the TruQC Document Library improves on-site accessibility and functionality with the ability to quickly store and access anything project related and even attach relevant documents to job reports for better documentation. In this blog post, we’d like to quickly illustrate how workflow is improved on a given job-site with the capabilities of Document Library. But first, you must really understand the functionality of our new Document Library. The TruQC Document Library allows you to remotely manage field employee access to job-specific documents like SDS, PDS, blueprints, scopes of work, contracts, employee certifications, equipment user manuals and more. The TruQC document library allows you to go into a field user’s “library” and add/remove documents as you see fit so that they have the information and tools they need to do their job. For instance, if the scope of work changes on a given job, you can easily remove the old version and upload the most current one. And that’s what we’re going to focus on in this blog post. Let’s say that you’re an industrial painting company that’s been hired to paint a really, really large, square metal building, exterior only. Four walls and a roof, nothing fancy. You have an admin team in the office and a team of painters in the field. It should be about a four-week project – provided the weather cooperates. The original scope of the project is to paint all four external walls of the structure green and the external side of the roof white. Easy enough, right? Right. So, you upload the spec sheets and scope of work documentation, giving your users in the field immediate access to needed project documentation. A few days into the project, your client decides that the last wall that was to be painted, actually needs to be white. And the roof, well now he wants it orange. So, three green walls now, one white one and an orange roof. Not to mention, an extra round of revised spec sheets and project documentation. No problem with Document Library. Simply revise the scope of work, upload it to Document Library and voila! Your field employees immediately have access to the new scope of work, detailing the project that started as four green walls and a white roof and has now changed to three green walls, one white wall and an orange roof. But then, the scope changes again. The outside looks great, but your client, with this freshly painted building and a talented crew already on-site, gives the high-sign to go ahead and paint the inside of the structure as well. One wall pink. One wall purple. One wall red. One wall lavender. The colors, yeah, we know. But regardless, a client’s orders are a client’s orders so your crew goes back to work. Luckily for them, with a simple check-in via the TruQC Document Library, they can see the new scope of work and can ensure an accurate delivery of exactly what the client is wanting. In normal circumstances, revisions to a scope of work can be a nightmare on an industrial painting job-site. But with the TruQC Document Library, it’s a much smoother process. And ultimately, that’s what we’re working day in and day out to improve. A smoother, more efficient job-site makes for projects that are on-time and on-budget, and clients and crews that are all on the same page and happy.